The question of whether you need a nitrogen credit in a corn-soybean rotation comes down to the environmental factors that affect soybean residue and soil nitrogen leading into corn. The N credit from soybeans comes from residue decomposition effects on inorganic N pools, not the fixed nitrogen from its nodules. Soybean grain has around 6.3 percent N, where corn is around 1.5 percent. This means quite a lot of fixed nitrogen is removed in soybean grain. So, in reality soybean does not provide a “nitrogen credit” to corn. The reason corn normally needs less N after soybean than after corn has to do with the differences in crop residue decomposition. Soybean residue has a lower carbon to nitrogen (C:N) ratio and decomposes quicker than corn residue. Thus, soybean residue releases N faster through mineralization, without soil microbes tying up inorganic N (immobilization) in the process. The nitrogen rate calculator already takes this “credit” into account based on the response to N we get when growing corn after soybean, compared to corn after corn, so there is no need to make any additional adjustments. Nitrogen in the soil converts quickly to nitrate. Once in the nitrate form, it can easily be lost through leaching or denitrification in wet conditions. Cover crops can help retain nitrogen in fields, especially those that didn’t have usual crops planted, or no crop at all. These fields allow for early fall planting of the cover crop and substantial growth (and nitrogen uptake) before it freezes. The cover crop will use whatever nitrogen is still available from the fertilizer applied for this growing season, plus the nitrogen that continues to mineralize via soil organic matter. That nitrogen will also be protected from leaching and denitrification losses. However, before the next crop can use it, nitrogen will have to be mineralized (converted from organic form to ammonium). One concern with grass cover crops is that because they can have high C:N ratios, they could potentially immobilize nitrogen that might not be mineralized in time for the 2019 crop to use it. Some worry that the cover crop might resemble a continuous corn system that typically needs more nitrogen than corn after soybean. This all depends on the amount of biomass produced by the cover crop and the C:N ratio. Very likely, you will have less immobilization (more N available) with a cereal cover crop like winter rye, than with corn residue. If you have a concern about this issue, use a mix of cover crops that include legumes. Regardless, to increase mineralization, terminate the cover crop a few weeks before planting and before the C:N ratio gets too large. You may see more immobilization when the crop is initially incorporated, but the net result will be quicker mineralization of the nitrogen captured in the cover crop residue. If the cover crop produces a lot of biomass and the C:N ratio gets large due to delayed termination, you may want to supply a small amount of N, like starter fertilizer, to help the corn crop get off to a good start while the cover residue is immobilizing N. Most likely, the immobilized N will eventually release in time for the corn crop to benefit. In low-laying areas of the field that received N but no crops grew or grew poorly because of water ponding, expect little residual N from the fertilizer because of leaching and denitrification losses. That said, low-laying areas tend to be higher in organic matter than other parts of the same field. 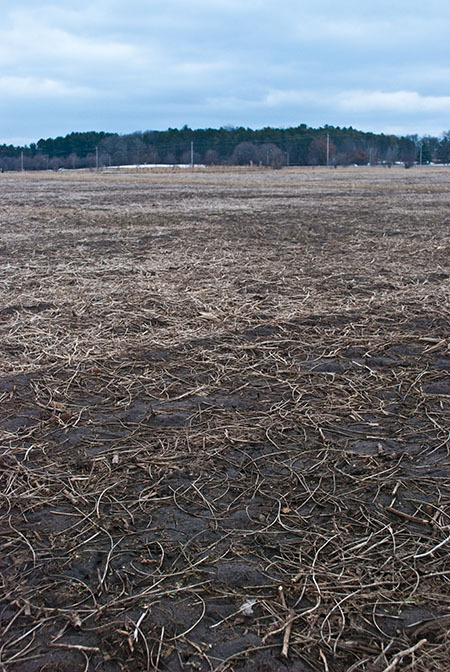 Because of that, these soils have substantial mineralization once they are not water-logged. Planting a cover crop in these areas could help protect N from loss if soil conditions turn wet again. We also get questions about applying nitrogen onto corn stalk reside in the fall or spring to help decomposition and mineralization. While it might seem intuitive to do so to reduce the C:N ratio of plant materials, research has shown that this practice does not help with residue decomposition and it might actually lead to less recovery of applied fertilizer due to loss. This is true even for early harvest when you might think that warm conditions would speed up the process.